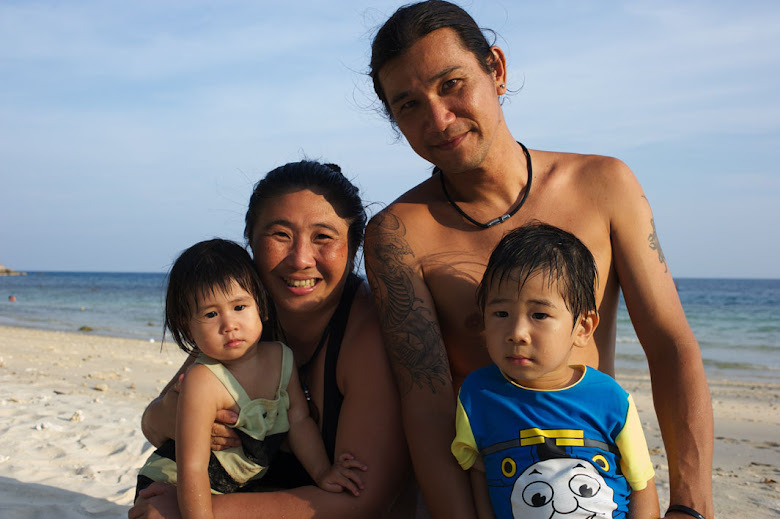 The stories of little beach bums: KJ & KA: My Journey "Home"
Papa and mama told me that we are going home...but I thought the one on the island is my home!? And why are we going home when we are home? Mama told me that every year during monsoon we have to leave the island home, and go to the mainland's home. First we will go to papa's home in Perak, and then we will go to mama's home in KL, and we will be moving everywhere during these 4 months. I am not sure if I like that. First, mama strapped me in the car seat that they have been preparing me in, and I slept in it straight away! When I woke up, I found myself still in the same small place with baggage all around me, I wanted to protest, but found all my favourite friends surrounding me, and that made me happy. But after a while I got tired, and hot, I started to make a fuss, and mama finally took me out of the horrible car seat! But I just want to go out of the small space. After making the adults singing my favourite songs, we finally arrived Kuku's (papa's sister) house, and papa decided to stay 1 night there because is my bath time, and I am not happy if he missed it! On the next day, we are ready to go out for the famous Ipoh Kuay Teow, but the heat made me grumpy, so my everything can papa prepare me the portable cooling station! I was very happy that morning! After breakfast we packed again, and mama told me we are going to see yeh yeh and mah mah (papa's parents). When we finally arrived at yeh yeh and mah mah's house it was very very hot! I miss my beach! And each time yeh yeh and mah mah carry me, I felt needles piercing all over my body. And papa and mama keep telling me off for crying! I am not allowed to go out because mah mah said there is a lot of mosquitoes outside and they carry virus! I don't know what is that, but I miss looking at the sky and the leaves! yeah! will ask my mama to set a date! hehehe...see you soon Sophie-Anna! baby made it home finally, must be so tiring for you and your papa mama mostly too. But most importantly, all 3 of you are home safely.